2008 Phantom Regiment drum major Will Pitts. "The Countdown" will light up movie screens at more than 400 U.S. theaters this Wednesday, May 13. The 2009 edition of Drum Corps International's annual spring cinema event will showcase six favorite DCI corps performances from the past six seasons. While drum corps fans could easily watch those same shows on DVD from home, they will come in droves to their neighborhood megaplexes on Wednesday to experience performances in high def and cinema-quality surround sound, and to see the "extras" – the cinema-only features that will preview what some select corps are fielding this summer. In today's Field Pass, Dan Potter "previews the previews" with former Phantom Regiment drum major Will Pitts, who has a starring role as "The Countdown's" roving reporter. Click to listen. (MP3, 11:39, 10.6 MB) Right click and "save as" to download. Learn more about "The Countdown." Subscribe to this podcast through iTunes. RSS feed. Field Pass archive. Have a question, comment or request for Field Pass? 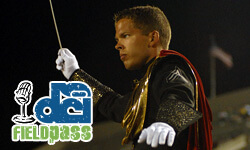 Leave a message for Dan Potter by phone at 317.489.9385 or by e-mail at fieldpass@dci.org.